We hear this often at EverCheck and it’s not uncommon for new partnerships to be forged as a direct result of career mobility among HR leaders. The Director of Human Resources at Healthcare Organization A decides to accept a role at Healthcare Organization B, and they’re excited to onboard a better solution for license verification. We of course love when this happens. For one, it means we’re providing enough value to healthcare organizations that their HR leadership sees fit to pitch the solution at their new organizations. Second, it means we really are forging trusting and lasting relationships with our clients. You trust us to do the job we said we would, and to do that for your new employer, as well. Subsequently, we get a lot of requests for resources to help pitch EverCheck to associates and leadership for approval. After all, getting buy-in from everyone who will be affected by this change is the key in making the project successful. So here’s a step-by-step guide to evaluating your new situation, determining whether automation is a viable option, and pitching EverCheck to your stakeholders. We’re spending time we don’t have verifying licenses for our population. We’re missing important license changes, like disciplinary actions, that may affect an associate’s eligibility to work. Our on-time renewal rate for our licensed population leaves a lot to be desired. Does everyone experience the burden of last minute renewals? We have no way of seeing the health of our organization’s license compliance as a whole. We’re outsourcing to another vendor and not seeing the value for what we’re spending. Run some numbers, pull some historical data, and make sure you really understand where your organization’s need lies. Being objective about your options. … performed on a large percentage of our licensed population every day. Automatically notify appropriate teams when changes are captured. Captures and houses Primary Source verification histories in one centralized repository. 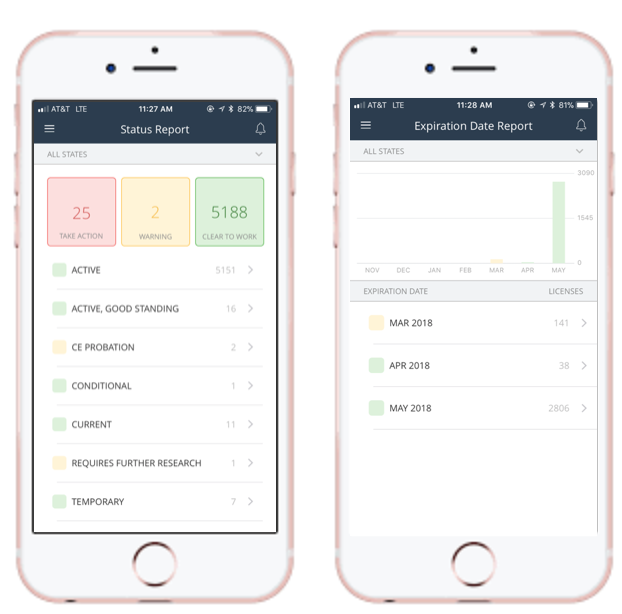 Aggregate reporting capabilities providing actionable insights. … and so on. This type of objective reasoning won’t hurt your chances of onboarding EverCheck as a solution, but it will show that you’ve done your research and have a vested interest in finding the right solution for your organization. State the need. I know we’re struggling to manage multiple facilities’ primary source verification needs. Our resources are dispersed and our data is disconnected. In my past role, we struggled with similar issues and I understand why our associates are frustrated with our current process. I recognized that this was a challenge for us, so I decided to do some research and see whether there are viable options to make this better, easier, and more compliant for everyone involved. Pitch EverCheck. From my research, I landed on EverCheck as our best option. Their HR solution fits the bill for many of the functions we’re missing in our current process, and I’ve worked with them in the past. I know their team and we’ll be in good hands. Here’s where you can (and should) get us involved. Your pitch deck should include a list of your pain points, your solutions research, and plenty of supporting evidence as to why you believe EverCheck is the right solution for your organization. We have a variety of resources available, from system screenshots to ROI worksheets and plenty more. The idea is to build an ironclad case, and we’re here to help you do just that. Contact us to request your resource package. Be realistic about the project requirements. Will your stakeholders need to see a product demo before they commit to moving forward? Then the goal of your pitch is to get them to say yes to a demo. Will your team give you the go-ahead to implement otherwise? Then the goal of your pitch is to get their blessing. Whatever your end game is for this pitch, go into knowing what you expect to get out of it. Our final note is that we’d like to say how much we appreciate you. If you’ve read this far, you’re likely considering referring your new employer to EverCheck. Our mission is to make healthcare work better and it’s partnerships like yours that keep us coming to work every single day. For additional resources or guidance, feel free to reach out to our team. We’re here to help.